In my time at Swarthmore, no group’s star has fallen more dramatically than Mountain Justice’s. A year ago, a majority of campus had signed on to their major initiative, divestment from the fossil fuel industry. When MJ teased a new announcement, students packed Parrish 1st to hear it. Protesters continuously occupied the hallways of the administration for more than a month. Certainly there were naysayers — the now defunct Swarthmore Independent, a student-run conservative online newspaper, ran several articles questioning the financial wisdom of divestment — but, for most of campus, the members of MJ were, in the words of Sarah Dobbs, “allies who can win.” It seemed like divestment could not, and would not, wait. A year later, MJ’s name is more of a punch line than the title of a credible political movement. After the Board of Managers firmly refused to divest from fossil fuels, MJ has threatened a series of increasingly ominous-sounding escalations. These escalations, it turns out, have consisted of little more than pointing out the fact that the wealthy investors who make up the Board are, in fact, wealthy investors. President Valerie Smith has sharply rebuked MJ for its “spurious allegations [and] individual attacks” against members of the Board. The divestment campaign has suffered from a massive loss of prestige on campus. Yet MJ persists in its demands, devising increasingly risible and ineffective methods of direct action — its theatrical protest outside of One Liberty Place stands out as a particularly impotent demonstration. I write disparagingly of MJ’s recent efforts not because I am unsympathetic to its cause. To the contrary – climate change is one of the most devastating threats the world faces. It’s the sort of thing that, when considered late at night, can, like the prospect of nuclear war or one’s own death, arrest the normal beating of the heart. The problem with MJ is not that it cares too much about climate change; its problem is that it has confused a losing tactic with a winnable goal. Despite its occasional appropriation of radical tactics and rhetoric, MJ is not a revolutionary organization. Its methods and aims are classically reformist. Using moral suasion, shaming, and democratic pressure, it seeks to convince a group of people in power to govern in a certain way. There is a fundamental problem here. The only people capable of effecting MJ’s program are those whom MJ antagonizes: the Board of Managers. If MJ did not earn its contempt during the 2013 Spring of Discontent, when it led an occupation of one of the Board’s open meetings, it certainly earned it when it attempted to protest in the lobby of Rhonda Cohen’s office. The Board can and almost certainly will continue to ignore the issue of divestment, because it is not directly accountable to the student body. But even if it were accountable, divestment today would be unlikely: MJ lacks democratic legitimacy. At Swarthmore today, the phrase “respectability politics” is the thought-terminating cliché du jour. Questioning the tactics or presentation of radical organizations is considered to be itself a form of oppression, because it forces radical organizations to conform to a standard of conduct set by an oppressor. This concept can be important and useful, particularly when applied to groups that represent historically marginalized peoples. But MJ does not, at least not in its current form, represent the marginalized. Nor can it claim any longer to represent the student body; it has not convinced the current student body of its seriousness. If it wishes to be taken seriously, it needs to reevaluate the efficacy of divestment as a tactic. Divestment has always been a largely symbolic initiative. Even many of its strongest proponents acknowledge that no individual divestment will have any real financial consequences for the fossil fuel industry. It isn’t even clear that a mass collegiate divestment would, in and of itself, have the sort of impact climate activists desire. Divestment is a tactic designed not to materially harm the fossil fuel industry, but to stigmatize it. A heavily stigmatized industry will be much less politically powerful, much less capable of resisting government attempts to curb emissions, regulate drilling, and invest in sources of energy that do not cook the planet. Divestment was always a means to an end, not an end unto itself. 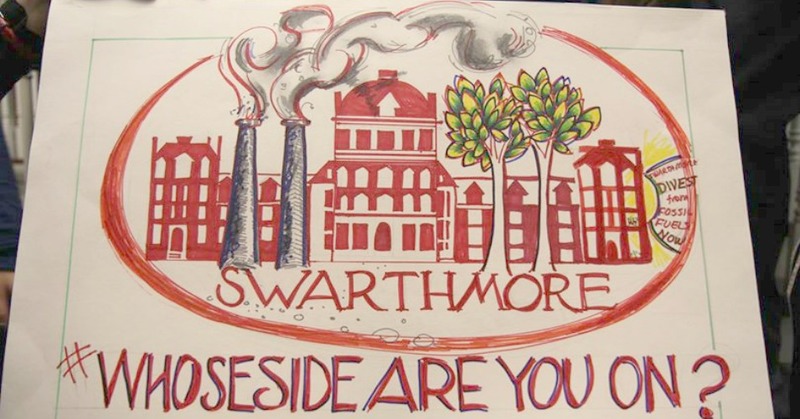 What we need is greater creativity in Swarthmore’s political engagement with climate justice. We need a climate politics that does not fetishize its failed tactics to the detriment of its real goals. By no means is divestment solely about “symbolism”; it’s about messaging, regarding the severity of our climate crisis, the willful culpability of the fossil-fuel industry in exacerbating that crisis, and the complicity of higher education institutions which invest in those businesses. It’s asking colleges and universities to align their investments with their values, as is demonstrably possible to do without harming profit returns. As regards such communications, Swarthmore Mountain Justice and other divestment campaigns have been very successful, even where divestment has not yet occurred. To say that MJ lacks democratic legitimacy is laughable. A majority of the student body is signed onto the petition asking for divestment, and last year an historic faculty resolution was passed in favor of divestment. Hundreds of alumni have signed the petition for divestment and pledged to withhold their donations until the school divests. You are right in pointing out that Swarthmore’s Board lacks democratic legitimacy or “accountability to the student body” as you put it. Who exactly is the Board accountable to, it does beg the question. It’s pretty intriguing that you called divestment a “failed tactic” seeing as the fossil fuel divestment campaign, founded at Swarthmore 5 years ago, has since become a global movement. Over the last 5 years, $3.4 trillion dollars have been divested from fossil fuel companies worldwide. Institutions such as the Rockefeller Brothers Fund, founded originally upon a fossil fuel fortune, have divested. The country of Norway and the city of Copenhagen have divested. Just last week, University of Mary Washington, Yale and JMU all divested. Just last week. 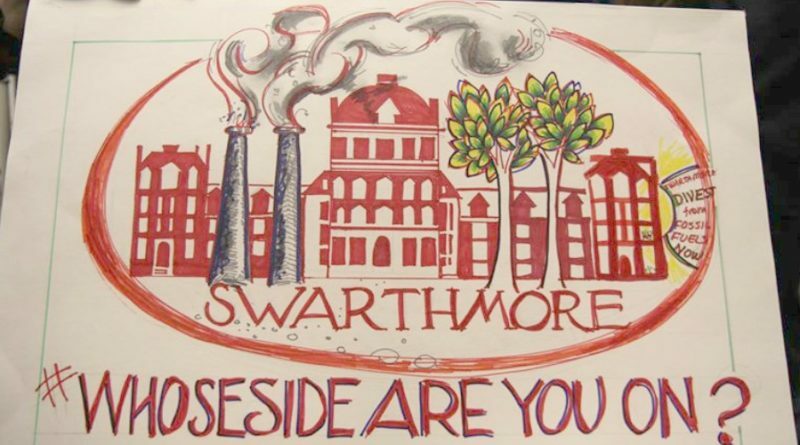 Failing is the Board’s insistence that divesting from fossil fuels is not inevitable, as peer institutions all around them take this step, and it is particularly shameful that Swarthmore has not divested since the fossil fuel divestment movement began on our campus. If you continue to doubt the efficacy of the divestment movement, take the word of the fossil fuel industry itself. Peabody Coal cited the divestment movement as one of the reasons it has recently had to file for bankruptcy. divestment is an extremely effective tactic that has done an incredible amount to stigmatize the fossil fuel industry over the last 5 years. Go MJ!